The Anti-Slavery Melodies songbook, from which this song was taken, was compiled by Jairus Lincoln (1794-1882), and published by Elijah B. Gill (1808-1874) in Hingham, MA, on the South Shore outside Boston. Lincoln compiled this book, published in 1843, on behalf of the local anti-slavery society. An abolitionist musical culture developed in the 1830s and 1840s, when abolitionist groups would include singing as part of their meetings. The words of the song itself were written by the famous abolitionist William Lloyd Garrison, and they were set to the tune of "Auld Lang Syne." The song is meant to encourage abolitionists to stand strong and resist the proponents of slavery in the battle for freedom and liberty in the United States. There is a lot of military imagery in the song, which was unusual, for Garrison was a pacifist. Part of this may be due to his history. 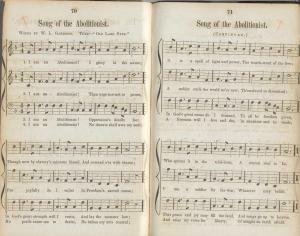 In 1835, five years prior to this songbook's printing, Garrison was dragged through the streets of Boston by an angry anti-abolitionist mob. In 1840 the abolitionist movement split into two groups, largely due to the increasing influence of women such as the Grimke sisters and Abby Kelley Foster. The traditional abolitionists did not believe women should involve themselves in the anti-slavery movement. Who spurns it in the trial-hour, A craven soul is he. I am a soldier for the war, Whatever may befall. That peace and joy may fill the land, And songs go up to heaven. And raise my voice for liberty, Of nought on earth afraid.